One of the specialities of our Paint shop is the vehicle custom colour change option. Why change your car when you can change the colour to whatever you desire. With the introduction of digital colour matching we can take your favourite shade and recreate it on your car. 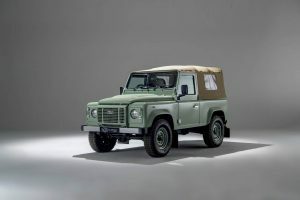 It’s been very popular to take an old Defender with tired, faded paintwork and transform the look by painting it in a classic Land Rover colour to the very highest standard. It’s all in the preparation to get the level of finish we insist on and each paint job gets days of work before and paint gets near the panels. When we say our rebuilt Defenders are fully customised, we truly mean it. If you decide to purchase a custom Defender from ACH Classic, you’ll have a say in every aspect of how your one-of-a-kind truck is built. Since we believe the colour of your truck will reflect your personality and create the unique look and feel you’re seeking, we are pleased to offer a wide array of creative colours. Let’s take a look at just a few of the various colours you can choose from. At our state-of-the-art facility in Silverstone we’re happy to help you select and implement the right colour. We do the paint work in-house giving each and every custom build the attention to detail and customisation that an outsourced painting company simply could never provide. 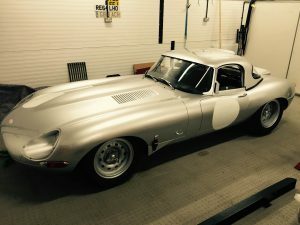 Whereas other vehicle painters rush through the process, at ACH Classic we won’t sacrifice quality in order to save time. Our highly trained and experienced artisan takes his time painting each vehicle to ensure the utmost quality and character. Over the years, we have fine-tuned our colour schemes and created a five-stage paint application process that allows us to paint every vehicle to perfection. First, your custom build will receive an epoxy prime. Then, our highly trained and experienced painter will paint it with a sealer coat, then a base coat in the colour of your choice, and finally a clear coat. Lastly, your custom build will get colour wet sanded so it can achieve a beautiful, silky smooth finish that will maintain its brilliance over the years..
Want to know more about our colour process here at ACH Classic? We invite you to come and visit our facility, including our high-tech paint bay, and expect to be wowed! Call us at 01327 353129 or email sales@achsv.co.uk to arrange a tour.